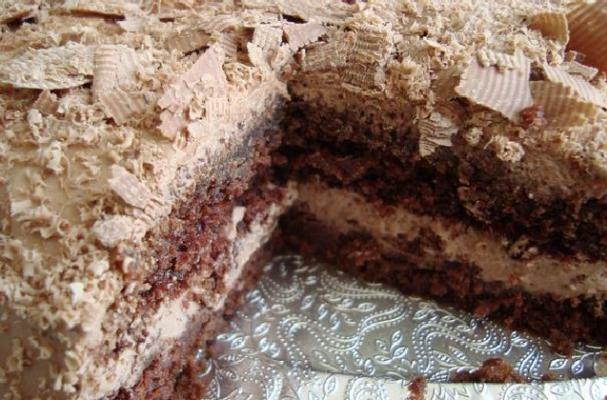 Chocolate cake is always a winner and this recipe for chocolate buttermilk cake is dynamite. The buttermilk in this cake keeps the crumb tender and delicate. It also adds a tang which compliments the richness of the chocolate. The cake is covered in a simple chocolate frosting that is flavored with orange extract. You won't be able to just have one piece. Add the vinegar to the milk and set aside. Cream the butter and sugar together until light and fluffy. Add the eggs and continue to beat until well combined. Stir the buttermilk and add it to the butter/sugar/egg mixture. Mix gently as vigorous beating will have the buttermilk flying all over. Sieve the dry ingredients together. Add them to the wet mixture and mix with a metal spoon until it forms a smooth batter. Pour into a greased 8” round baking tin and bake at 185˚C (or 350 F) for about 35-minutes or until a toothpick inserted in the center comes out clean. Remove from oven and cool before turning out and icing. Gently whisk the double cream and sugar together until in increases a bit in volume. Add the melted chocolate and orange essence and continue beating until smooth and glossy and almost holding stiff peaks. Chill in the refrigerator for about 15-20 minutes until it firms up a little and is spreadable without being runny. Then split the cake in half and fill the center with half the mixture. Use the rest to frost the rest of the cake. Chill until ready to serve. NOTE: I usually use whipping cream but my supermarket was out of it. When doing so, beat the cream until it doubles and forms soft peaks. Add the chocolate and beat until the mixture is stiff with firm peaks. Then ice the cake.